Ford Motor Company is working with telecommunications equipment company Qualcomm to ensure that as vehicles become increasingly connected to mobile devices, infrastructure, and the vehicles around them, every part of that inter-connected system is speaking the same language. Ford’s bid to standardize “cellular vehicle-to-everyting” communications – or “C-V2X” – technology is an important component of its efforts to execute its “Smart Mobility” vision, allowing urban transportation to offer greater flexibility, efficiency, and access. What Ford’s work with Qualcomm means is that, in the future, vehicles will hopefully have a standardized way to send and receive information with other vehicles (“vehicle-to-vehicle”, or “V2V”), with infrastructure (“vehicle-to-infrastructure”/”V2I”), and with pedestrian devices like bicycles (“vehicle-to-pedestrian”/”V2P”). In the context of autonomous cars, where cellular vehicle-to-everything communications will likely see the most use, this means that beside being equipped with LiDAR/radar sensors and cameras that allow the vehicle to observe its environment in real time, they will also have foresight to allow them to effectively “see the future.” They’ll know ahead of time whether a nearby car is about to make a turn or change lanes, whether an approaching traffic light is soon to turn red, and whether a lane-splitting cyclist is approaching from behind. 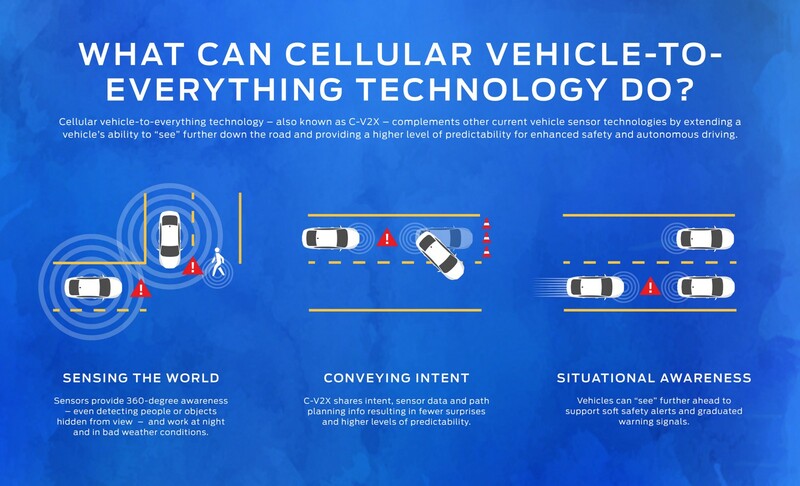 Ford’s cellular vehicle-to-everything communications standards are being developed to take advantage of the cellular industry’s next-generation 5G cellular broadband network, enabling the expedient transfer of large amounts of information in real time.